When a household’s projected income reaches the target, that’s the age at which they can expect to retire comfortably. But people don’t necessarily make decisions that are in their best financial interest. Indeed, 54 percent of those in the least-educated group will face an income gap if they retire when they said they’re planning to, compared with just 36 percent of the best-educated group. Retirement experts, including economists at this Center, urge baby boomers to hold on and work just a few more years to improve their retirement finances. But less-educated older workers often have physically demanding jobs or poorer health, making this very challenging, or even impossible. You are quite right. 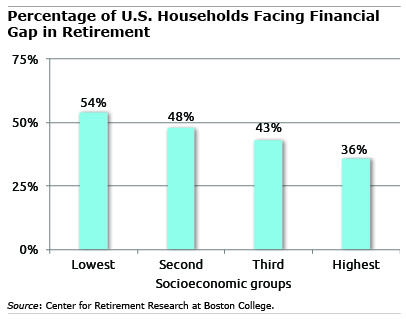 Most people will definitely face an income gap in retirement. So there should be done something about it. Retirement is one of the most important life events many of us will ever experience. From both a personal and financial perspective, realizing a comfortable retirement is an incredibly extensive process that takes sensible planning and years of persistence. Even once it is reached, managing your retirement is an ongoing responsibility that carries well into one’s golden years. Just as during our working years – where people don’t necessarily make decisions that are in their best financial interest resulting in significant income gaps – those same decisions impact the income gap when we retire. Decisions have to be made regarding education early on – attending K-12 school, graduating high school, attending post-secondary education (college/university, trade school, etc.). Decisions also have to be made regarding one’s personal life early on – not being truant from school, not using drugs, not getting pregnant, not committing crimes, basically…making the right decisions to stay out of trouble. Making the right decisions early on in life to overcome whatever hurdles are placed in one’s way are necessary to have a good financial retirement outcome.